You can fold yourself a drawerful of shirts by following an instructional video. I used this one and then referred to this one when I got stuck. our money is plastic and not foldable so i won't get to have that kind of fun - yeah no more paper money here in Aus. This "Essential life skill" series is killing me. So funny! I'm a banker, so I really should learn how to do that. Yeah... the hog/boxer story. Will he never live that down? I love these Essential life skill posts. I fold my money into frogs. Kaeru is Japanese for frog, and also Japanese for returning, so folding money into frogs means the money will come back to you. It's also fun to make the frog jump around the table when the waitstaff at a restaurant is ignoring you. I also will shoot stars made from straw wrappers at my husband (though I'll have to learn to make him roses, since that's nicer). Another essential life skill for restaurant boredom: I can make a bunny hand puppet from a napkin. does this mean we should keep a supply of money origami on hand in case of parallel parking failure incidents? You're a genius. I think a stack of shirts would go a long way toward soothing an angry dented car owner. 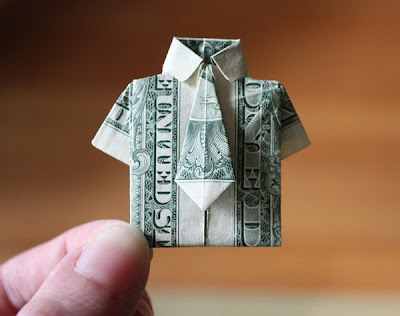 adorable :) I used to fold shirts, but the tie is new to me. I also knew how to fold money into a peacock at one time, too. ooooo that is soooo cool! thanks! These essential life skills are great! This series is cracking me up! One of my all time favorites! I tried a straw paper rose today. I need more practice! That is amazing and great for a father's day gift idea. I loved the toilet paper one the other day...which I might have to surprise my weekend guest with but i am sure they would rather me surprise them with a money shirt...lol. Such a nice post, really interesting, really admire your work, to have some more of it,Thanks. I love this as an "Essential Life Skill!" I used to have a book on money origami, maybe I should look around for it. I figured it would be funny to open my wallet and pay in shirts and rings! Great blog! I knew visiting your blog would cheer me up today! you are briliant!!! and sooooo talented!! bravo..
My friend used to always make a ring out of a dollar bill as part of a tip. I still have one in my jewelry box. Oh this kills me, I love it! One time this guy stopped me on the shirt and gave me a folded bill in the shape of a shirt...it had a piece of paper with his number inside. Creapy or cool? I wasn't sure. My dad taught us origami so we would be quiet during church. At restaurants, he used to fold his tips into little hearts or elephants. The waitresses loved it. The waiters didn't seem to care either way. Totally love this -- and am practising! too cute! i was thinking that this would make a great father's day gift or a birthday gift for a guy. This is so cute. Now where is that last $ of mine? How cool are these?? Love it! Wanted you to know I posted a link to this tut on my blog. As always, it's a terrific tut. I hope you don't mind, I featured this on my blog today. such an amazing idea! now I just need to learn to fold straight. I know lots of people who would enjoy receiving their very own "shirt", am about to start making some. Great present idea! I love it! Sharing with my Facebook readers! I made this a few years ago for my oldest son. We have a running family joke that one year at Christmas I wrapped a shirt for him and on the gift tag wrote "TO: Matt From: Shirt instead of From: Mom. So I folded a $50 bill as a joke gift for him and wrapped it with a tag saying To: Matt From: Shirt. He loved it! But one thing he mentioned that he wishes I had used only a $1 bill so he could have kept it. He hated unfolding it. Anonymous #1, I haven't seen any written instructions, I'm afraid. Anonymous #2, your "From Shirt" story is funny! Probably a nice new crisp bill would be great to work with...definately will try this! Very essential tool. :) Thanks Clair for the written instructions with pictures. I was having a hard time following the video. lol i use origami to pass time during church and waiting for food at restraunts. Thanks for the great idea! I've given you a shoutout! Wow! I love this so much!!! I made a shirt and pants and taped them together. then i added body parts made from sticky notes cut up. I Put it all on a card with a ten dollar bill to pop the origami man up when the card opens. It looks SO GOOD! Haha! My uncle always asks for cash but my mom and I applaud ourselves for being awesome gift givers and find the idea of cash as a gift, impersonal. But since he insists, we can fold a bunch of these and put them inside a Macy's box, to tease him until he opens it, presenting them as the shirt he turned down for cash! I give these things as tips, the waitress get a kick out of them and show them off to everyone. One waitress gave me a hug for making her two of them. HI Jess! I was browsing for grad gift ideas on Pinterest and ran across this pin from your page! I feel almost like we got to catch up over coffee or something -- well, not QUITE like that -- but still really cool! Hope you're well! Hi Jenny! Fun to hear from you, and hope you and the fam are doing great!